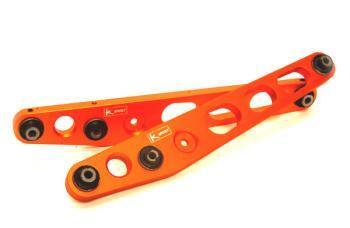 These extreme lower control arms are for Honda Civics and Acura Integras. These help reduce unsprung weight by over 30% from factory versions. Made from aircraft quality billet 6061 aluminum they are built to withstand maximum force. They also solve rubbing problems when lowering the vehicle with wider tires. They are the perfect compliment for your Ksport coilover kit.